Festival International de Louisiane is a non-profit organization that produces the largest international music and arts festival in the United States with a special emphasis on the connection between Acadiana and the Francophone world with an estimated economic impact of 49 million annually. With over 300,000 festival goers every year, the annual festival features musical performances by artists from over 20 countries along with workshops, exhibits, visual art, theater and other forms of performance arts. 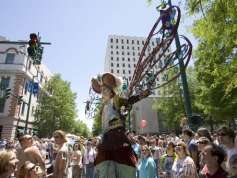 The 5-day festival is held in April transforming downtown Lafayette, Louisiana into an entertainment mecca.